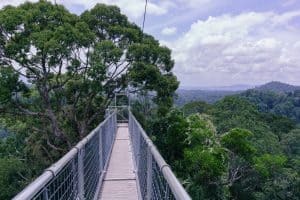 If you google “Things to do in Brunei” one of the top results is bound to be the Ulu Temburong National Park and its Belalong Canopy Walk. 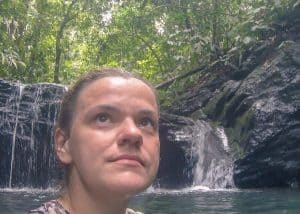 So when my friend Gabriela and I visited the tiny Asian nation during our short Borneo holidays, the jungle trek was also on our Brunei itinerary. 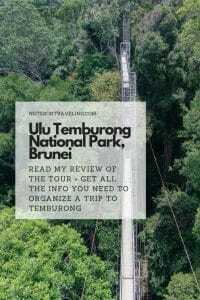 This travel guide contains an account of how I booked and experienced the Ulu Temburong tour with BorneoGuide. Further down, I’ll give you all the practical info you need to organize your own trip along with information about getting to and staying in Bangar town and Temburong region. The Temburong rainforest covers an area of more than 500 sqkm, and only a tiny fraction of it is accessible. 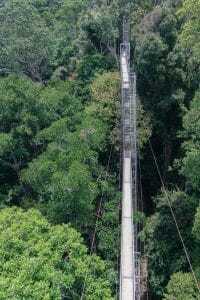 Ulu Temburong National Park with its canopy walk is the main attraction of the Temburong district, which is separated from the rest of Brunei by a sliver of Malaysia. That is why you’ll have to book a tour to make a trip to Ulu Temburong happen. ensures me that we won’t miss the boat and that we’ll have to pick up three more people anyway. 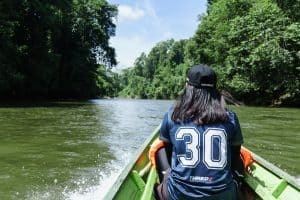 We had booked the Ulu Temburong National Park tour only two days ago and somehow assumed it was only the two of us – after all the price list gave prices only for bookings of 1 or 2 people. But the more the merrier! We pick up a Japanese mother-and-daughter team and an elderly German woman before we reach the Bangar speedboat jetty at eight. At the jetty, we are handed over to a beaming young woman. She bids us sit down while she handles the tickets. A few minutes later, she informs us that there was no more space on the 8:30 boat and we’d have to wait until nine. I’m slightly irritated: Why wouldn’t she have bought the tickets before? The situation is what it is and we settle down to relax for an hour. At a quarter to nine, commotion starts: the next boat has enough passengers already and is ready to leave. We hop on board of the small speedboat. The benches offer seats for about 20 people and bright orange life vests are dangling from the ceiling. None of the passengers bothers to put them on. As the boat picks up speed the open windows offer a welcome breeze in the morning heat. The ride takes us from the wide Brunei River into a maze of channels. Sometimes we slow down to lessen the impact of the waves caused by BSB-bound boats that pass us by. After 45 minutes of only water and jungle, we finally reach a settlement: tiny Bangar is the only town in Temburong and the only place for locals to go shopping in this region of Brunei. In Bangar, we are welcomed by Seha. The bubbly young woman introduces herself as our guide for the day. Who rule the World? At BorneoGuide it’s clearly women! We jump into the car and meet our driver for the day. OK, he’s a dude. But he remains largely silent in the background while chauffeuring the ladies first in the car and then in the boat. Less than a minute later, we get back out of the car: we’ve reached Bangar market where we’ll buy snacks. After another 20 minutes on the road, we’re at Sumbiling EcoVillage, where BorneoGuide has their park lodge. 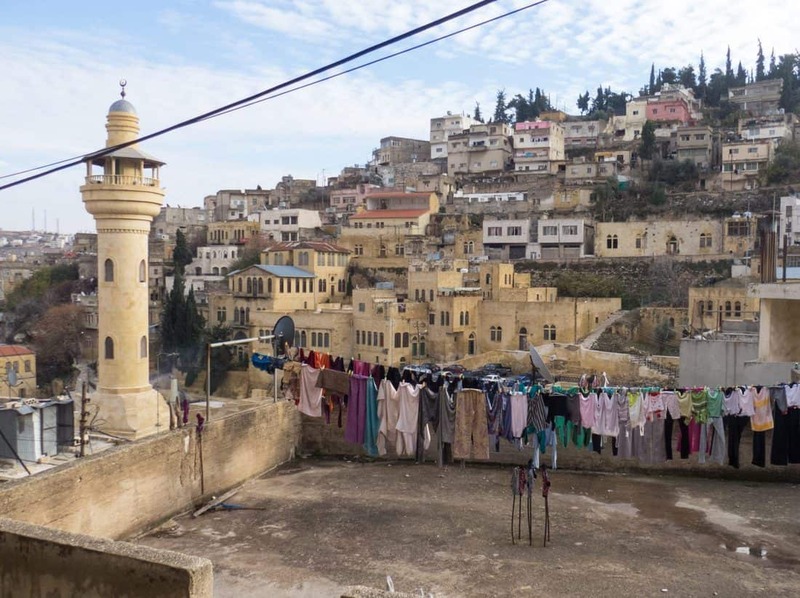 Seha tells us that this is her ancestral village and that her grandfather made a deal with the tour company renting them the land with the added requirement to hire Sumbiling’s people. I don’t know about you but that’s the kind of tourism development I’ll gladly support with my dollars! Like Seha, about 20% of the people living in this Eastern part of Brunei are members of the Iban tribe. 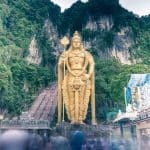 In contrast to their Malay and Chinese compatriots in Muara, Tutong and Belait districts in the West, they are not Muslim but have their own spirituality inspired by the forest and the animals. Throughout the tour, Seha will weave stories about her family’s traditions into her guiding. And it’s a sheer joy to see her excitement about giant ants, calling birds, and approaching rain storms. At the EcoVillage, we have time to go to the toilet, have a cup of coffee or tea, refill our water bottles, and eat the snacks from the market. They are fried bananas, fried vegetables, and fried surimi crab sticks. Half an hour and a short briefing about the schedule later, we leave behind anything we don’t need for the Ulu Temburong Canopy Walk and the waterfall swim, grab a life vest each as well as a pair of rubber shoes and head down to the river. The narrow boat has exactly seven low seats, neatly set up one behind the other. Our guide Seha sits in the front, the driver in the back, tourists in the middle. The journey upriver takes another 45 minutes. The driver has to exercise great care when navigating the frequent rapids. 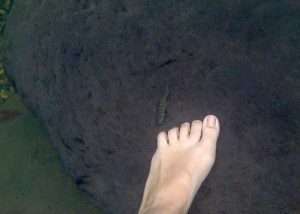 Even though it’s the end of the rainy season the water is shallow enough to see the bottom of the pebbled river bed more often than not. I hear that in dry season passengers are sometimes requested to leave the boat and help push it across particularly shallow spots. But today, we can just enjoy the ride through the rainforest. The only people we see are at the handful of lodges we pass – shortly after Sumbiling comes Freme, then Outward Bound, then the abandonded Outward Bound lodge, and, finally, UluUlu Resort. The UluUlu Resort jetty is also where we have to stop to register our entry into Ulu Temburong National Park. We put our names and ages into the big book and set out for one more 5-minute boat ride. 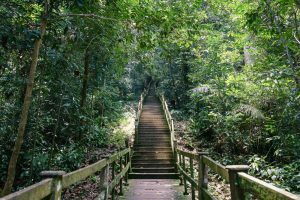 At the starting point of the climb up to the Ulu Temburong National Park Canopy Walk, there is no fancy jetty, just a bit of cleared forest wide enough for us to walk in file to reach the path. With the rain of the past days, the path is muddy and it requires focus not to step into bogs or slip. Fortunately, it only takes a few minutes before we reach the dreaded stairs. A hanging bridge that would have connected this point to the UluUlu Resort lodge is closed because of a landslide on the other side. Seha promises that the national park service will come by in the coming weeks, once the weather is drier, to fix it. Depending on who you ask, there are 700 or 800 stairs up to the Canopy Walk. There is enough space for two of us to walk side by side. The wooden stairs are uneven, sometimes barely as high as the width of my (dainty lady) hand, sometimes half a foot high. The wood on the walkways between sets of stairs is warped but look stable. This is not a walk in the park. To make the ascent a little easier, there are four huts along the stairs with benches to sit, catch a breath, and watch nature unfold around us. I am hoping to see monkeys. But Seha explains that they have no interest in hanging out near humans. We finally reach the Canopy Walk, and I am not prepared for this. To reach the canopy walkways, one has to climb a metal scaffolding around the trees. Five walkways and three towers with even better views of the surrounding jungle rise above us. No more than five people at a time on the Canopy Walk. Only one person at a time on each set of stairs (let’s call them ladders, shall we!). Only two persons at a time on each of the platforms between the ladders. Only two persons at a time on the towers. Only two persons at a time on the walkways. At least it’s low season and we’re the last group of the day. So we have the canopy walk to ourselves. Since she would be number six in our group, Seha tells us she’ll wait at the bottom. The elderly German lady bows out citing fear of heights and the narrow stairs. I put my GoPro into my trouser pocket and my camera around my shoulder, and decide to leave water bottle and backpack behind. Gabriela and I go first, followed a few moments later by the Japanese women. 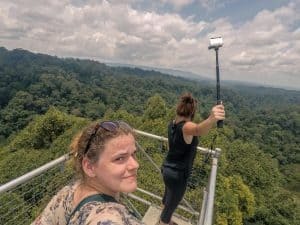 How do you climb the Ulu Temburong Canopy Walk if you are afraid of heights? The key is to only focus on the step ahead. Don’t look down, don’t look up, don’t look around. What feels like half an hour later, we have reached the first walkway and the option to climb the first tower. Since Seha had advised us that the views from the first and the third tower were the best and pretty much identical, we decide to continue climbing. Having barely reached the top, which seems to be swaying under Gabriela’s and my weights, I can hear the Japanese women following us. With panic in my voice, I yell at them to not come up: Only two persons at a time on the towers!!! When Gabriela joins the yelling, the mother-daughter duo finally hears us and turns back. 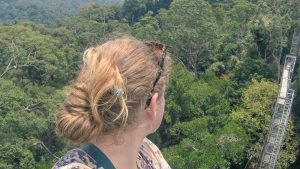 I barely dare move as we take in the view of the endless rainforest from high above. I am now holding my breath not just for fear but for the stunning endless sea of green I behold. Climbing down requires the same kind of focus as going up, and as we pass the walkways I intently look for any movements in the trees that might indicate monkeys. But no such luck. Taking it slow and photos and videos along the way, we spend more than 30 minutes on the Canopy Walk. When we get down, the rest of the group is eagerly awaiting us. We head back to the boat and go downstream, past the UluUlu Resort, to the abandoned Outward Bound buildings. Time to put on the rubber shoes. I opt for my flip flops, instead. We wade up a small stream, which ends in a cute waterfall, maybe three meters high. It’s not stunning but that’s just what I need to come down: jump into the refreshing waters of the pool under the fall, have the nibble fish nibble the dead cells off my legs and feet, climb to the second small fall a bit further up the stream and do the same again. After half an hour or so we notice menacing grey clouds in the sky above us. The afternoon rains that are typical for the end of March are rolling in, and we’d do better to head back to the village lest we want to get stuck in the boat on the river in the rain. Surprisingly, the journey downriver to Sumbiling EcoVillage takes almost as long as the upriver journey as the driver is making sure we don’t get swept away by the water. We manage to stay ahead of the rain. It starts beating down the second we’ve reached the village and the cover of the eating area. Lunch is included in the Ulu Temburong National Park tour and is freshly prepared by an aunty of Seha’s. It’s simple, typical Brunei food: rice (of course! ), a rich chicken stew, mixed vegetables, and fern greens that remind me of steamed spinach. It’s a delicious and filling lunch that makes all of us get up for seconds and some even for thirds. As I am just settling down with my afternoon coffee, Seha motions that we have to get moving: we have to get back to Bangar so we don’t accidentally miss the last ferry to BSB. So I gulp down my coffee and we get back into the car. It’s the same story as on the way to Temburong times two: since Seha has to buy the tickets for us when we reach Bangar ferry terminal, we not just have to wait for the next boat but for the one after that. The spanking new ferry terminal is busy and I recognize some people from the morning ferry that are heading back home. There is freezing air conditioning and plenty of seats but not much else to do. We get on a boat at 4:30. Back in BSB, our driver is already waiting to drop us off at our hotels. We get back to the GinaSuite at five-thirty with just enough time for a shower and a snooze before dinner. Sorry about the quality of some of the photos – taken on GoPro and with a shaky hand. 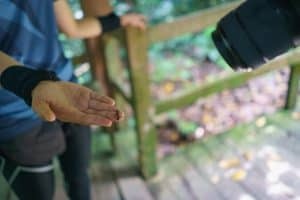 The day we arrived for our short Brunei visit, we checked into our hotel and after a nap and a lunch went into town to find the cheapest Ulu Temburong National Park tour. I had expected a host of tour agencies downtown Bandar Seri Begawan (aka BSB) clamoring for tourists to book their tour. But the center of the capital of Brunei is as quiet as the rest of the city. So we checked tour provider addresses online and went straight to the BorneoGuide office. The address listed on their website is only a few steps from the central BSB bus station. BorneoGuide occupies an office on the first floor of a nameless hotel opposite the Brunei Hotel. We stepped inside and were greeted by the sales staff. Our inquiry for an Ulu Temburong tour was met with a laminated paper listing the options. 150 Brunei-$ (about US-$120) per person (when booking for 2 or more people) for the day trip to Ulu Temburong National Park incl. all transport, filtered water, snack, lunch, and the famed Belalong canopy walk. We angled for a discount – being travel bloggers and all. But the 10% reduction compared to the price listed online is all we could get. A call to the guide in charge and a filled in form later we handed over our 300 Brunei-$ in exchange for a list of items to pack and the request to be ready at 7:30 am sharp. Note that high season for Ulu Temburong National Park tours – according to our guide – is November to February, i.e. Christmas and winter holiday season. In those months, booking ahead is strongly advised. There are only seven companies that are allowed to do tours into Ulu Temburong National Park and they are also the only ones to offer official accommodation in Ulu Temburong and along Temburong river. Their names and contact details are displayed as you leave the Bangar ferry terminal. BorneoGuide: the eco version employing local staff and offering tours from Bandar Seri Begawan along with overnight stays in their Sumbiling EcoVillage with accommodation in a handful simple huts (no A/C, shared bathrooms) and tents. Freme: the sporty one. Their lodge features a climbing wall. AZ Back to Nature: the other eco one. I didn’t see their camp along the river. Borneo Trekkers: another option when you want to support grassroots efforts in local communities. Tours start earlier in the morning. Trandie Marina Resorts: the oldest provider with more than 20 years experience. Outward Bound Brunei Darussalam: the Brunei government one. Tours are geared towards team and character building for Brunei students. 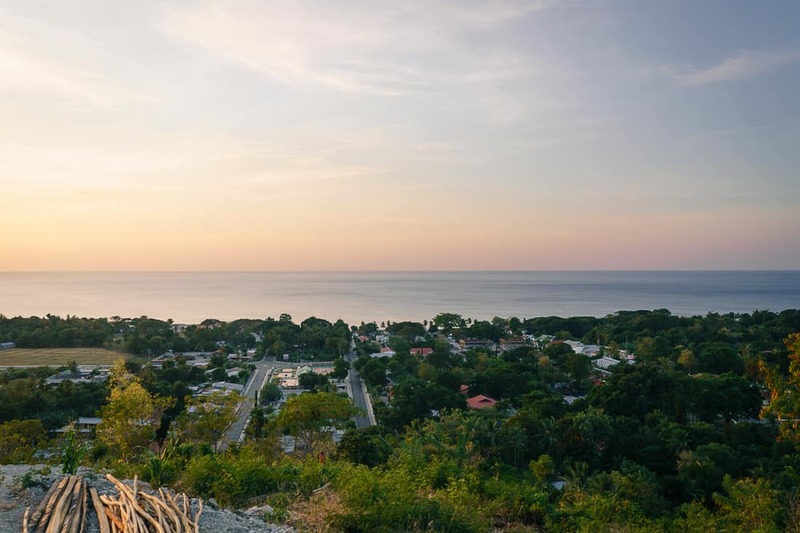 When you book a tour, check that the itinerary points you are interested in are included as, for example, some tours offer jungle treks without canopy walk. Also, when comparing prices verify whether US-$ or Brunei-$ are quoted. Accommodation offered ranges from simple tents to dorms to luxe lodges but is generally on the more expensive side. 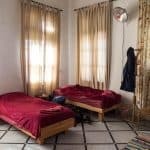 Expect to pay US-$20+ per night for the cheapest options and remember that you are in the jungle and will have to get all your food on-site. Note: You cannot go on your own into Ulu Temburong National Park! Access to the National Park and the Belalong Canopy Walk is only possible by boat or by helicopter if you have the funds (the road from Bangar ends at the Outward Bound lodge). I am a big fan of just showing up and booking tours on the ground. More than once has this strategy lead to significant discounts compared to online price. However, if you want to be sure that you get the tour of your choice on the day of your choice, if you are traveling with a larger group or if you want to have a private Ulu Temburong National Park tour, booking ahead is advised. You can simply contact the tour companies listed above directly via email and sort out all the details ahead of time. I have added the links to the six tour operators that sell public tours in the list. 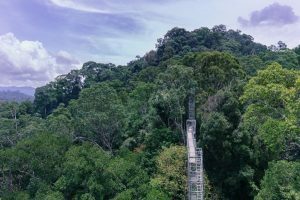 However, researching for this guide, I also discovered a few options for Ulu Temburong Canopy Walk and National Park tours on Viator, the experience-booking platform (they are part of the TripAdvisor group). And the prices look to be the same as you find on the tour operators’ websites, if not slightly cheaper in some cases. 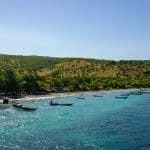 I found tours starting at the US-$120 we paid at BorneoGuide. Click here to see the Ulu Temburong National Park tours on sale via Viator. Even though it is a tiny country as it is, Brunei is split into two parts: the larger part includes the capital BSB and the smaller part is Temburong, largely jungle dominated by the Ulu Ttemburong National Park and with a population of only 10,000 people (or 2% of the Brunei population). 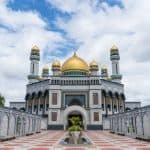 If you plan to travel Brunei on a budget you might think that staying in Temburong and doing daily excursions is cheaper. However, this will be a challenge if you don’t have your own means of transport as the local infrastructure is not made for backpackers on a small budget. The speedboat ferry goes about 10 to 15 times a day in each direction 7 days a week, leaving from the jetty next to Sungai Kebun Bridge. The first boat leaves after sunrise and the last one returns safely before sunset. The journey one-way costs 7 Brunei-$ for adults. Each boat offers space for max. 20 people. Even though there is a schedule the boat will leave when it’s full before the scheduled departure time (and the driver is ready). The speedboat weaves through the network of channels along the Borneo coast with little more than jungle to the left and ride (I counted less than a dozen houses). The only time you’ll see the open sea is near the construction site for the new bridge that is supposed to connect BSB and Temburong as soon as 2019 (looking at the progress, I highly doubt the deadline will be kept). Journey time is about 45 minutes. Life vests are available but you’ll sit inside the boat, protected from the elements. If you want to travel by car from BSB to Bangar/Temburong you have to pass two border crossings: you have to stamp out of Brunei near Kuala Lurah, loop via Limbang and re-enter Brunei at the Buda Buda border crossing. I spoke to several locals and they all reckon that each border crossing takes about 45 minutes – the duration of the ferry ride. Once the bridge between BSB and Temburong is finished, you’ll be able to bypass Malaysia and cut the car travel time down to under an hour. But as I mentioned above: I think it will be a few more years before that happens. The only hotel in Bangar – as the locals will proudly tell you – is the Stoneville Hotel. It is not represented on any of the booking sites and the only active web presence is on Facebook (the web link you’ll find there takes you to an image with contact details). Just a few steps from the jetty you’ll find Bangar’s produce market. Even at its most crowded – in the morning – it’s a pretty quiet affair. The few stalls on the market sell local fruit and vegetables, a few cooked items and sweets, as well as basic supplies such as salt or oil. There is not a huge selection of eateries or restaurants in Bangar. Shopping center Bumiputera Main Complex has some restaurants. But you’d best plan to eat wherever you are staying. 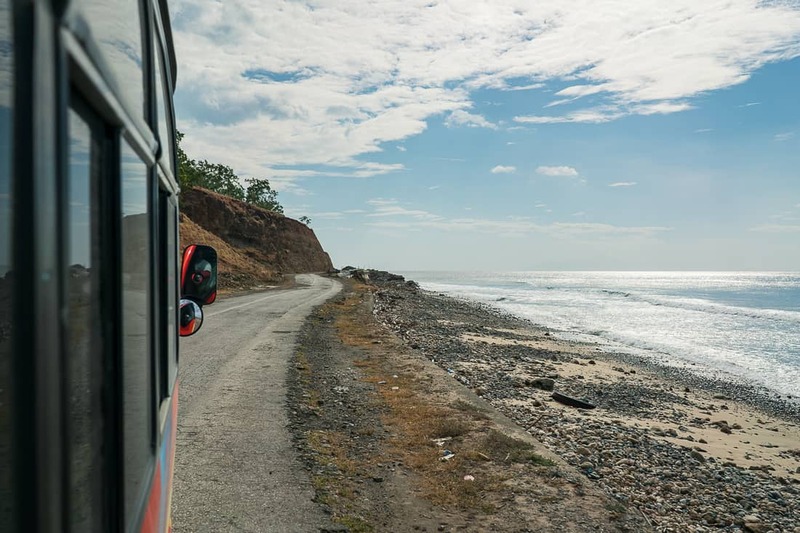 Temburong has few proper roads: the two main ones are the connection from Bangar to the Outward Bound lodge into the National Park and the Temburong crossing taking you from one Malaysia border to the other. Off those roads, locals move around in small boats. But don’t count on anyone offering you taxi services. 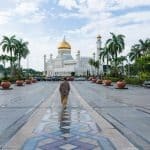 You’ll have to ask around and might find it easier to plan excursions from Bandar Seri Begawan. A visit to Temburong is the perfect opportunity to just chill and do a lot of nothing. Bangar Town offers the market, a sculpture commemorating the 60th birthday of the Sultan, and a few shops selling a variety of items from handicraft, clothes to daily necessities. Temburong doesn’t really seem to care for tourists. Beyond the Ulu Temburong National Park, there are a few smaller nature reserves/parks with Mangroves and jungle that are equally hard to get to if you don’t have your own transport, namely Selirong Island (mangrove forest), Peradayan (aka Bukit Patoi Recreational Park), Batang Duri Recreational Park (which includes a minizoo with local animals), Taman Aie Tenub in Kampung Selapon, and Labu. Another interesting sight is the traditional Iban longhouses which were and still are – in a more modern form resembling from the outside typical Highway motels – home to whole families with grandparents, aunts, uncles, etc. If you decide to stay at the BorneoGuide accommodation in Sumbiling EcoVillage you can also check out the longhouses there as the people of Sumbiling are Iban.